October 31 – Russia and Bahrain maintain good relations in the defense sector and the kingdom will invite Moscow to take part in the first international defense exhibition expected to be held in the country in 2017, Bahrain’s ambassador to Russia Ahmed Abdulrahman Saati told on Monday. “I can say that the relations [in the defense sphere] are good. I also want to say that in 2017, the Kingdom of Bahrain will org…anize the first major international exhibition similar to that [Russia] held in August…We will send them [Russian companies] an invitation to take part in it later,” Saati said in an interview. In August, Bahrain’s King Hamad bin Isa Al Khalifa visited Moscow and the two states signed a number of agreements and memorandums, including in the military sphere. The king also attended the Army-2016 military expo. MOSCOW, September 9. /TASS/. Russian President Vladimir Putin and King Hamad bin Isa Al Khalifa, of Bahrain, discussed military-technical cooperation issues during the latter’s visit to Russia earlier this week, Russian presidential spokesman Dmitry Peskov has said. “Military-technical cooperation issues were actively discussed with the Russian side on several occasions, including contacts with Russian President Vladimir Putin during King of Bahrain’s recent visit,” Peskov said, when asked if Russia might sell its air defense systems S-400 to that country. 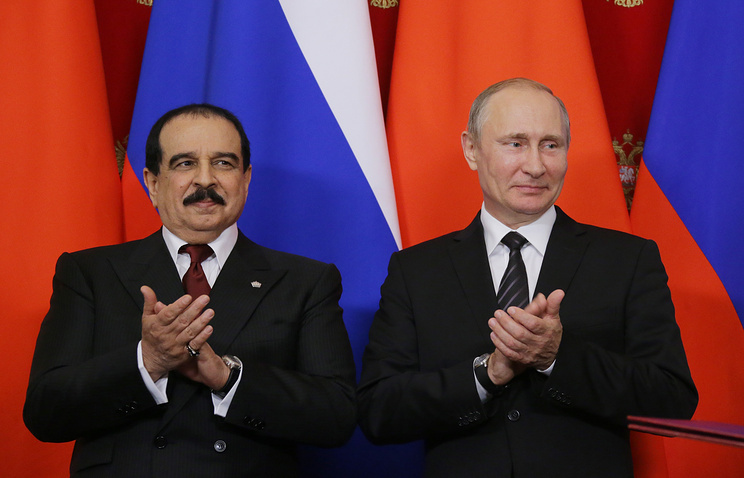 Putin and the King of Bahrain met in the Kremlin on September 6. The two leaders discussed ways of struggle against terrorism, the situation in Syria and trading and economic cooperation. Bahrain’s Ambassador to Russia Ahmed Abdulrahman Saati said that Bahrain is interested in renewing air defense systems and delegation from Bahrain will assess S-300 and S-400 systems at the Army-2016 expo in Russia. Bahrain is interested in renewing its air defense systems, and its delegation, headed by King Hamad bin Isa Al Khalifa, will assess S-300 and S-400 systems at the Army-2016 expo in Russia, Bahrain’s Ambassador to Russia Ahmed Abdulrahman Saati told Sputnik. “We are interested in everything new, in renewing [air defense] systems. However, we do not have information regarding the contracts or acquisitions being made, this is classified military information,” Saati said. “Overall, we are interested in military products, air defense systems, we came to closely assess them. There is an exhibition here where we can see them, military experts will be able to assess them and their suitability, they’ll be able to see, in particular, these two systems [S-300 and S-400,” he added. September 5 – King of Bahrain Hamad bin Isa Al Khalifa will attend the opening ceremony of the Army-2016 international military forum to be held near Moscow on Tuesday, Bahraini Ambassador to Russia Ahmed Al Saati told on Monday. “King of Bahrain Hamad bin Isa Al Khalifa will visit the expo on Tuesday and attend the opening as only head of state,” Al Saati said. According to the ambassador, the King will m…eet Russian President Vladimir Putin on Tuesday at a Bahrain-Russia summit. “During the summit in Kremlin the countries’ ministers will sign a military-technical cooperation agreement, an accord to establish an intergovernmental economic committee and two memorandums of understanding (MoU) with Gazprom and Rusgeology on gas and oil cooperation,” he said. The military forum, which is set to take place on September 6-11 in Kubinka, a western suburb of Moscow, will bring together representatives from the Russian defense industry, research institutes, universities, as well as foreign companies. Over 800 Russian and foreign participants will mount some 7,000 exhibitions throughout the week. The forum’s participants and guests will attend a number of conferences and round-table discussions to discuss the future development of military technology. Last week, the King’s administration announced he would arrive in Moscow on Monday. According to the Kremlin, the sides will discuss the fight against international terrorism.